If you want more space in your children’s bedroom, then the Cotswold is right for you. It’s a traditional yet modern style bed frame that has a fixed ladder. It’s made from sturdy and high quality materials. The Cotswold mid sleeper includes a two door cupboard beneath along with a pull out study desk and a 3 drawer chest. You can teach your child to be organized as he or she enjoys this mid sleeper. 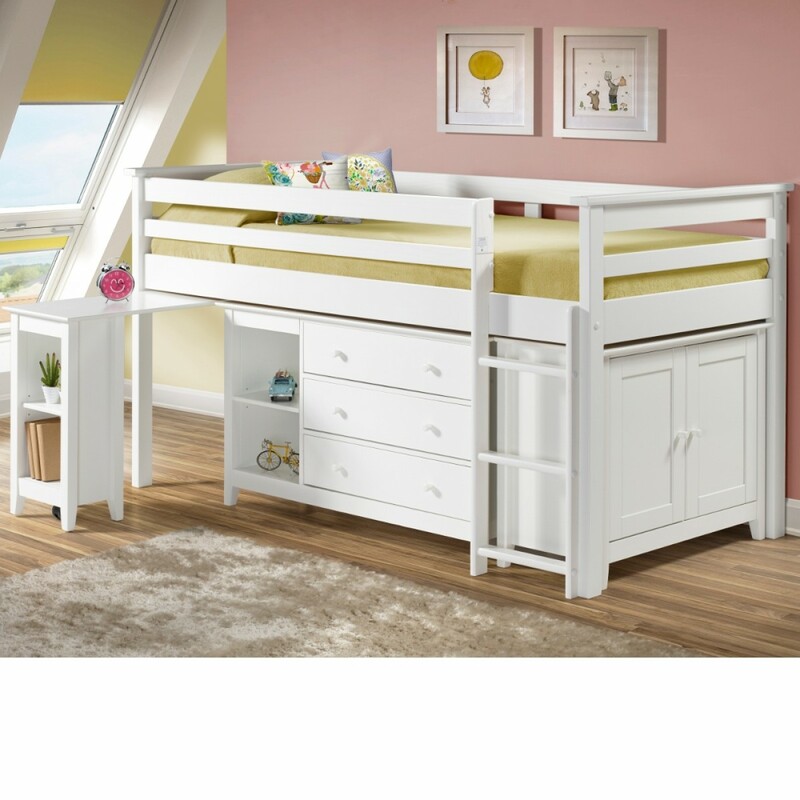 This pine constructed midi sleeper is finished in a beautiful white colour. The Cotswold has a solid slatted base for extra firmness and support. You can choose this bed with or without a mattress, please see the bullet point features for individual mattress specification. This bed comes flat packed for ease of delivery and can be easily assembled using the instructions provided. What is the configuration inside the little cupboard? Is it 2 shelves? Inside of the cupboard of the Cotswold is a single large space, designed to store taller items. This set is packed in whow many packs??? The Cotswold Mid Sleeper Station Bed comes in 6 separate cartons weighing between 13 and 25 kg. The height of the furniture that comes with the Cotswold is 71.5cm and is assembled separately so can be used in any capacity that you deem suitable around the room. Can the configuration be change to mirror the set up shown? Because the construction of the Cotswold is asymmetrical, only the setup position shown in the images would be possible. The dimensions for the Cotswold furniture is as follows: the desk is 35 cm x 90 cm, the chest is 115.5 cm x 40 cm, and the cupboard is 40 cm x 86 cm.